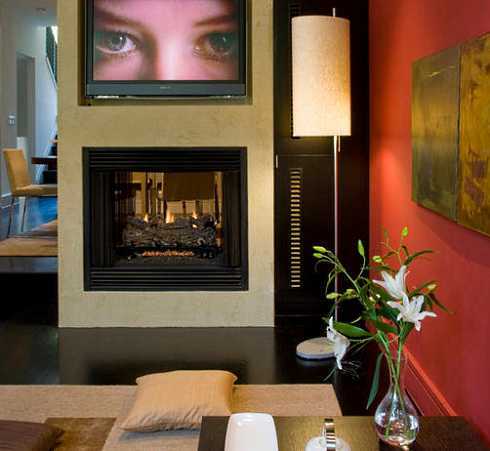 Fireplace Design Ideas, #03 -- How To Create A Striking Plasma Television Fireplace Surround! scribing to our monthly newsletter! Each issue features a design Idea Of The Month with beautiful photos to inspire you and -- more importantly -- to help you discover new and creative ways to personalize your OWN special Fire Space! If you like this newsletter, please do a friend and us a big favor and "pay it forward." If a friend DID forward this to you and you like what you read, please subscribe by visiting our informative subscription page. This month's Fireplace Design Idea Of The Month features the plasma television fireplace surround . . . . and ideas about how to create one for your home. 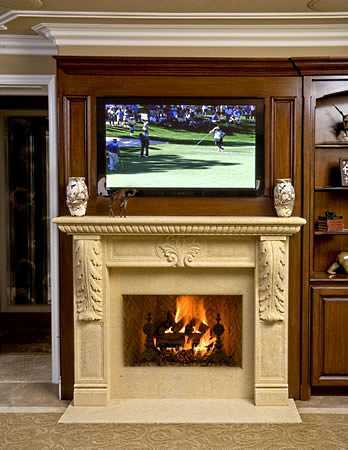 Many plasma televisions are simply mounted on the wall above the fireplace mantel. However, as with built-in kitchen appliances or built-in shelving in the living room or family room, your plasma television will have a much more finished look if it is built in or, at least, "partially" built in. The design pictured above is an example of what I refer to as "partially" built in. 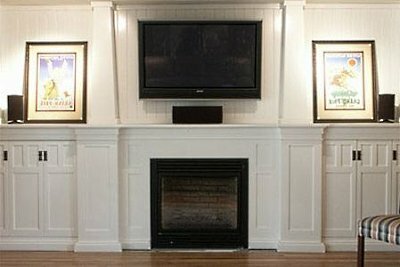 Though the plasma television is not actually recessed into the wall, it is centered above the firebox opening and "framed" by two pilasters that extend upward from the mantel shelf of this striking Craftsman Style design. In addition, due to a wide range of options in mounting hardware today, the TV is mounted close to the wall in a fully upright position. larly in the early years of flat screen TVs when mounting hardware choices and framing options were limited -- is pictured at left. 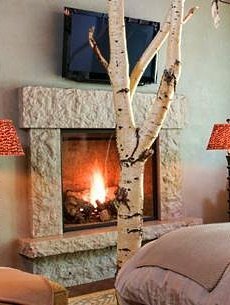 Unfortunately, the wall-mounted TV looks a bit out of place in this room, which features a bed with rustic birch tree bed posts and a roughly chiseled -- albeit very striking -- stone fireplace surround. The more formal design that follows features a handcarved stone mantel and a plasma television fireplace surround of richly finished wood paneling. 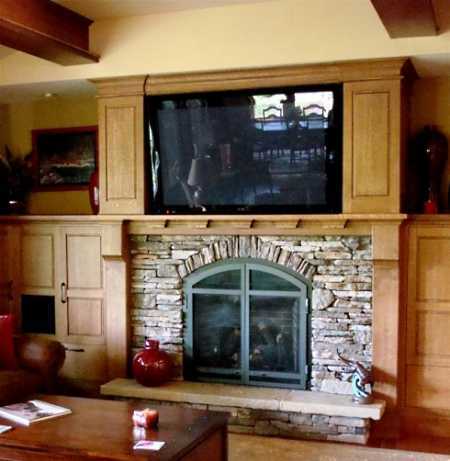 Partially recessed into the paneling above the stone mantel, the TV is flanked by vertically oriented wood panels that help to give it a finished, built-in look. The cultured stone fireplace that follows is by Heritage Hearths Masonry and features a wood Arts and Crafts mantel flanked by built-in cabinetry. A large plasma television set rests on the cabinetry just behind the mantel shelf and beneath an overhead soffit with concealed lighting. Matching millwork and paneling extends upward from the mantel shelf to the soffit to enclose the TV. Pictured below is a gas fireplace set in a contemporary surround that also serves as a room divider. Designed by Andreas Charalambous of Forma Design, the surround includes a built-in recess for a plasma television and features a Venetian plaster finish on both sides. cludes a built-in recess or niche centered above the firebox opening. 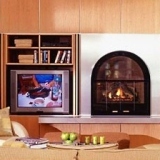 Designed by Christopher Grubb of Arch-Interiors, Inc., the tiled fireplace surround is inset with backlit panels that flank the TV and provide a warm glow. Designs & Ideas By Clicking On The Following Links! To Hide Or Not To Hide? 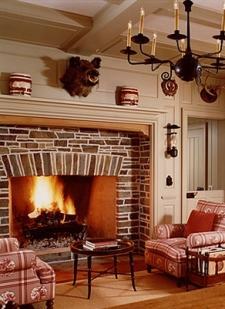 How To Create A Cozy Country Hearth! Upcoming Issues Of Our Monthly e-Newsletter!